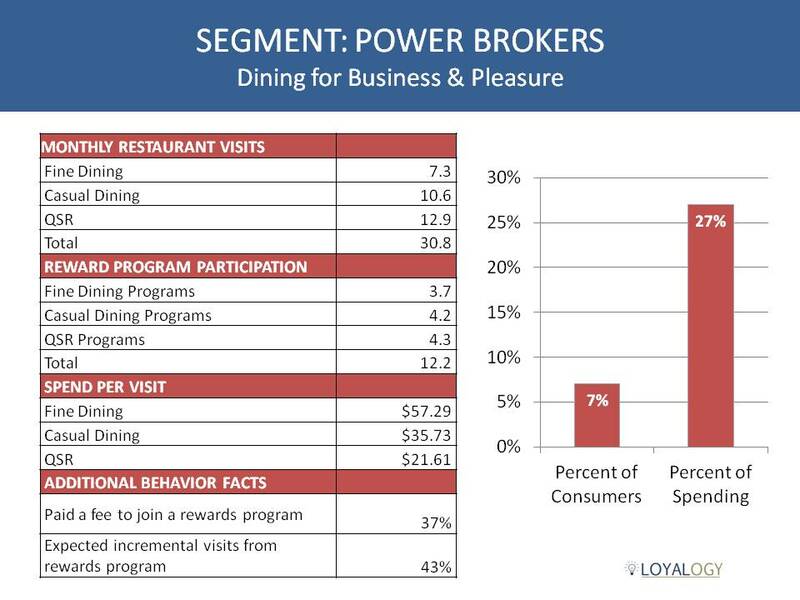 The Rewarding Diners consumer segmentation of restaurant diners and use of restaurant loyalty rewards programs helps restaurant companies understand dining and loyalty behavior among discrete consumer segments. The segmentation is based upon a U.S. national survey with 1,122 responses from consumers aged 25 to 65 with household incomes of $75,000 or more. Improved targeting by understanding those guests that represent the greatest opportunity. Loyalty programs are tie-breakers that allow companies to generate incremental visits by shifting visits within the category from a competitor to your brand. By understanding how many visits per month certain consumers have in the category, you may compare how many visits they have with your brand to understand how many additional visits may be shifted to your brand. Comparison of this national-level segmentation, with breakouts by QSR, casual dining and fine dining, against an individual company’s guest composition. This is best accomplished by comparing the data in this segmentation to a similar survey conducted with your specific guests. This segmentation study provides a framework that may serve as a starting point to use when placing guests into a segment based upon their results to a survey. Better understanding of the makeup and likely needs of segments to maximize relevance in marketing efforts. These consumers represent 7% of the population and 27% of the spending. They use restaurants for business and pleasure. They’re young (52% less than 35 years of age), successful (35% have a household income of $150,000) and they source meals from restaurants every day. Their average monthly restaurant visit rate is 30.8 and they use all types of restaurants, with 7.3 fine dining visits, 10.6 casual dining visits and 12.9 QSR visits. The highest percentage of their restaurant category spending is in fine dining (39%). Power Brokers are 57% male and well educated – 78% have a bachelor’s degree or graduate degree. Among this group, 37% have paid a fee to join a restaurant loyalty program. They’re highly engaged with restaurant loyalty programs with an average participation of 12.2 programs. They’re highly motivated by loyalty programs – they estimate their visits will increase 43% as a result of an appealing restaurant loyalty rewards program. This segment is labeled ‘Good Fellows’ because 71% of the members in the segment are male. They use restaurants for business and pleasure. They represent 10% of consumers and 14% of spending. They cluster in the 35-54 age range (58% in that range) and in the lowest income bracket among the sample (45% with household incomes of $75,000 – $99,999). Their average monthly restaurant visit rate is 14.5 and they use all types of restaurants, with 2.3 fine dining visits, 4.9 casual dining visits and 7.3 QSR visits. The highest percentage of their restaurant category spending is in casual dining (39%). Good Fellows are 71% male and well educated – 70% have a bachelor’s degree or graduate degree. Among this group, 26% have paid a fee to join a restaurant loyalty program. They’re moderately engaged with restaurant loyalty programs with an average participation rate of 5.3 programs. They’re highly motivated by loyalty programs – they estimate their visits will increase 39% as a result of an appealing restaurant loyalty rewards program. This segment represents 16% of consumers and 10% of spending. They use restaurants for business and pleasure. They cluster in the 35-54 age range (59% in that range) and in the lowest income bracket among the sample (46% with household incomes of $75,000 – $99,999). Their average monthly restaurant visit rate is the lowest in the ‘business and pleasure’ category at 6.7. They use all types of restaurants, but at a moderate rate with 1.1 fine dining visits, 2.4 casual dining visits and 3.3 QSR visits. The highest percentage of their restaurant category spending is in casual dining (44%). Working Values are 56% male and well educated. 65% have a bachelor’s degree or graduate degree, but of note is the fact that this group has the highest percentage of graduate degrees in the study (25%). Among this group, only 14% have paid a fee to join a restaurant loyalty program. Their engagement level with restaurant loyalty programs is low with an average participation rate of 2.0 programs. However, they’re still motivated by loyalty programs – they estimate their visits will increase 36% as a result of an appealing restaurant loyalty rewards program. This segment represents 10% of consumers and 20% of spending. They use restaurants only for pleasure. They cluster in the 35-54 age range (53% in that range) and in the lowest income bracket among the sample (55% with household incomes of $75,000 – $99,999). They use restaurants regularly, with an average monthly visit rate of 22.3. 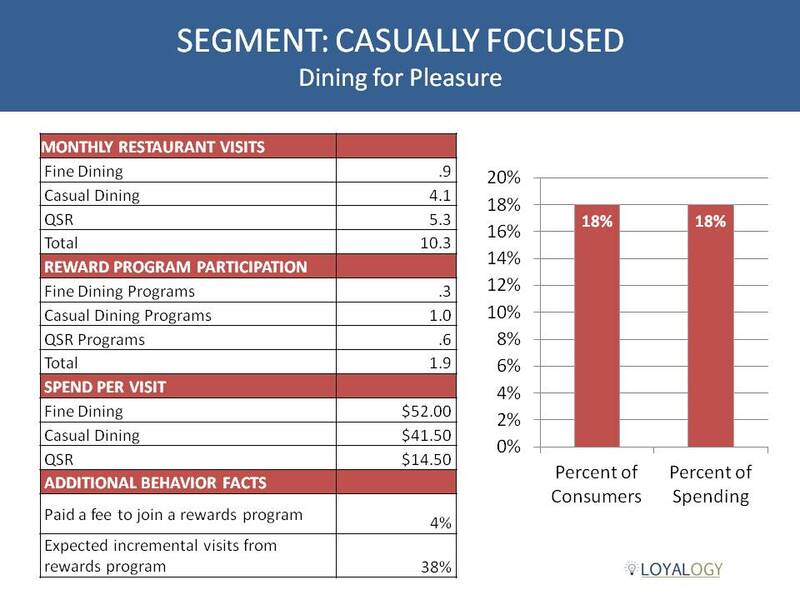 They use fine dining about twice (2.1 times) per month, but the lion’s share of their restaurant visits are in the QSR (12.4 visits per month) and casual dining (7.8 visits per month) categories. The highest percentage of their restaurant category spending is in casual dining (48%). On The Go are 57% female and well educated. 64% have a bachelor’s degree or graduate degree, but of note is the fact that this group has the second highest percentage of graduate degrees in the study (24%). Among this group, only 13% have paid a fee to join a restaurant loyalty program. Their engagement level with restaurant loyalty programs is moderately low with an average participation rate of 3.3 programs. They’re motivated by loyalty programs but at a rate lower than the population average – they estimate their visits will increase 30% as a result of an appealing restaurant loyalty rewards program while the overall population average is 35%. This segment represents 18% of consumers and 18% of spending. They use restaurants only for pleasure. They cluster in the 45+ age range (64% in that range) and in the lowest income bracket among the sample (52% with household incomes of $75,000 – $99,999). They use restaurants about once every three days, with an average monthly visit rate of 10.3. They use fine dining occasionally – about once (.9 times) per month. Most of their restaurant visits are in the QSR (5.3 visits per month) and casual dining (4.1 visits per month) categories. The highest percentage of their restaurant category spending is in casual dining (57%). Casually Focused are 65% female and moderately well educated. 56% have a bachelor’s degree or graduate degree. 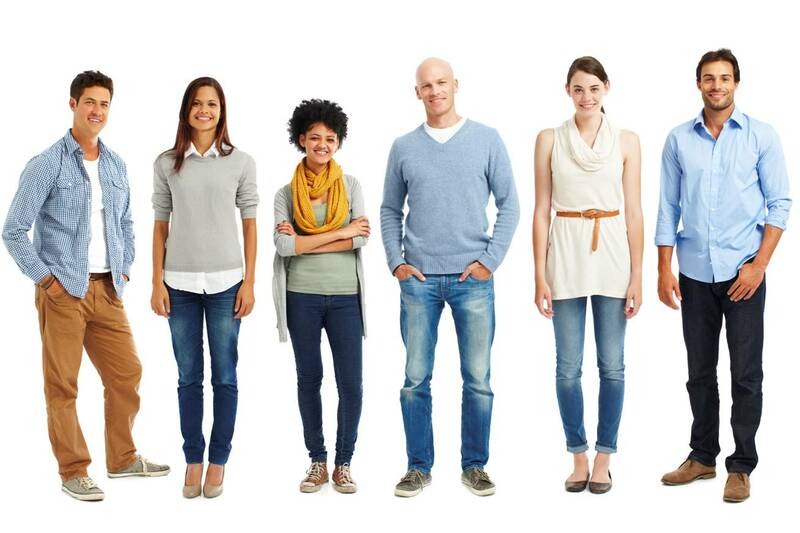 Among this group, only 4% have paid a fee to join a restaurant loyalty program. 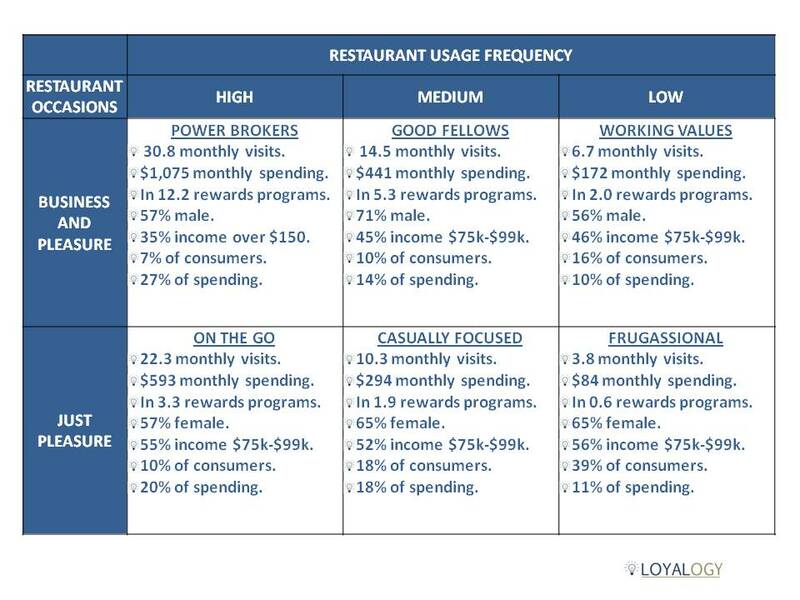 Their engagement level with restaurant loyalty programs is low with an average participation rate of 1.9 programs. But, they’re motivated by loyalty programs – they estimate their visits will increase 38% as a result of an appealing restaurant loyalty rewards program. This segment represents 39% of consumers and 11% of spending. They use restaurants only for pleasure. They cluster in the 45+ age range (74% in that range) and in the lowest income bracket among the sample (56% with household incomes of $75,000 – $99,999). They use restaurants about once per week or less, with an average monthly visit rate of 3.8. 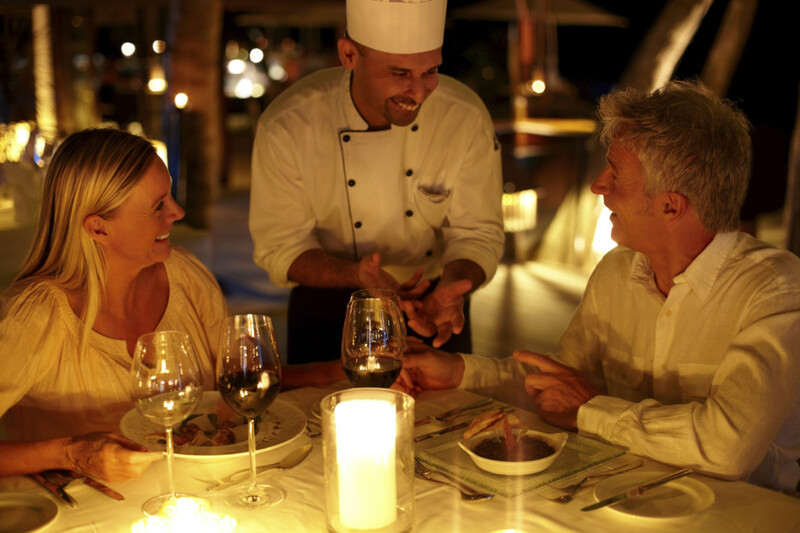 They use fine dining rarely – about once every three months (.3 times per month). Their sparse restaurant visits are in the QSR (1.9 visits per month) and casual dining (1.6 visits per month) categories. The highest percentage of their restaurant category spending is in casual dining (58%). Frugassional are 65% female and moderately well educated. 57% have a bachelor’s degree or graduate degree. Among this group, only 1% has paid a fee to join a restaurant loyalty program. Their engagement level with restaurant loyalty programs is very low with an average participation rate of just .6 programs. But, they’re motivated by loyalty programs – they estimate their visits will increase 31% as a result of an appealing restaurant loyalty rewards program as compared to 35% for the overall population. Two segments – Power Brokers and On The Go – represent just 17% of consumers but 47% of spending. On the other end of the spectrum, Frugassional and Casually Focused represent 57% of consumers and just 29% of spending. For fine dining restaurants, Power Brokers represent the greatest opportunity. They dine out daily, use fine dining restaurants on a regular basis and spend the greatest percentage of their restaurant spend with fine dining restaurants. They’re quite likely to pay a fee to join a rewards program and are highly motivated by rewards programs. Good Fellows are a secondary focus for fine dining restaurants and a primary focus for casual dining. For casual dining restaurants and QSR, On The Go represents the greatest opportunity. They dine out more than 22 times per month and are more focused on casual and QSR than fine dining. They’re not as highly motivated by rewards programs as other segments, but they still estimate a visit rate increase of 30% as a result of a good loyalty program. 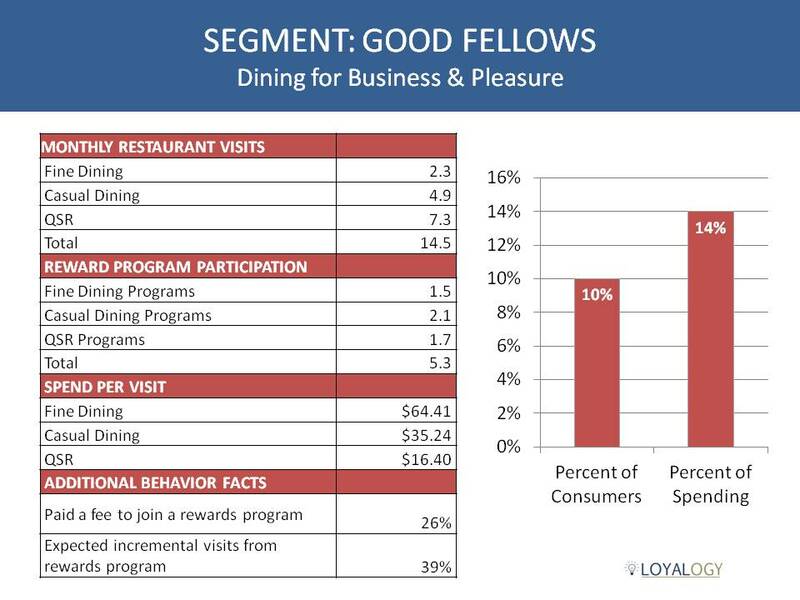 Good Fellows and Casually Focused are a strong secondary focus for casual dining because of their concentration of spending in that category and their level of motivation as a result of loyalty programs. The Working Values and Frugassional segments are not strong targets for restaurant rewards programs. They are motivated by rewards programs, but their lifestyle or life stage dictates a limited level of restaurant usage. Their conditions may change in a manner that encourages or allows more restaurant usage, but restaurant companies should be mindful that if they engage with these consumers in a loyalty program, they will demonstrate a low visit rate. Last month we released our 2014 consumer study on attitudes and behavior regarding restaurant rewards programs. The study yielded great insights especially with respect to certain consumer segments we explored in the analysis of the results. The Millennials sub-segment is one of great interest to restaurant operators because those among the Millennials group with household incomes of $75,000 per year or more are much more engaged with restaurants and with restaurant rewards programs. 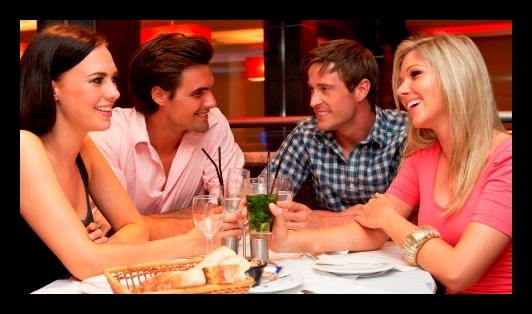 This group visits restaurants more and is more likely to visit restaurants for both business and pleasure. They participate in far more restaurant rewards programs and they are more motivated by restaurant rewards programs. It’s not surprising that they’re more heavily engaged in technology than the older segments of the population. They’re the group that is much more interested in using a mobile app to manage their interaction with rewards programs. They’re also much more likely to use online ordering (through a website and a mobile app) and use services such as Open Table, Yelp, Urban Spoon and Trip Advisor. Click here to get a free PDF of the Millennials report and click here to access free detailed datasets at the Loyalogy website for Millennials and other segments. Having lived most of my life far away from the ocean, there are few things I enjoy more than fresh, skillfully prepared seafood. When paired with a savory steak or ribs, the combination is nothing short of divine. With this in mind, I am delighted to see that the Chart House is offering customers its own loyalty program to compliment their famous seafood and steaks. Earn Points – 1 point for every dollar spent at participating Landry’s locations. Birthday Reward – $25 Reward which can be redeemed during your birthday month. Priority Seating – Receive seating privileges, seven days a week. Gift Cards – Earn points when you purchase gift cards. Online Access – 24-hour access to your account to review transactions, point balances and rewards. Email Notifications – You will receive information about rewards and other important club news. Faster Delivery of Rewards – Rewards are automatically added to your account, so no more paper gift certificates! Member-only access to special offers and promotions, including our entertainment and hospitality venues. When customers sign up for the Landry’s Select Club at Chart House, they will have access to an array of restaurants and venues, as well as the opportunity to earn multiple rewards and perks. For more information, visit the Chart House website. Few cities in the United States have a culinary tradition as strong as New Orleans. The unique blend of French and African heritage mixed with the signature Cajun flash has produced something of a national treasure. Copeland’s of New Orleans has continued this proud tradition for the past 30 years, and they have recently rolled out the Lagniappe Club to give diners something else to rave about. Earn points every time you dine or have drinks at a participating restaurant. Points may be redeemed for food and drinks as well as exclusive rewards such as a New Orleans getaway weekend. A free steak or equivalent on your birthday. A free bottle of wine or equivalent on your membership anniversary. Exclusive member’s only offers and promotions. As customers earn points at Copeland’s, they can redeem these points for Copeland’s dining rewards. Customers will receive a $25 reward for earning 300 points, a $50 reward for earning 500 points, and a whopping $100 reward for earning 800 points. For more information about perks and participating locations, visit the Copeland’s website. 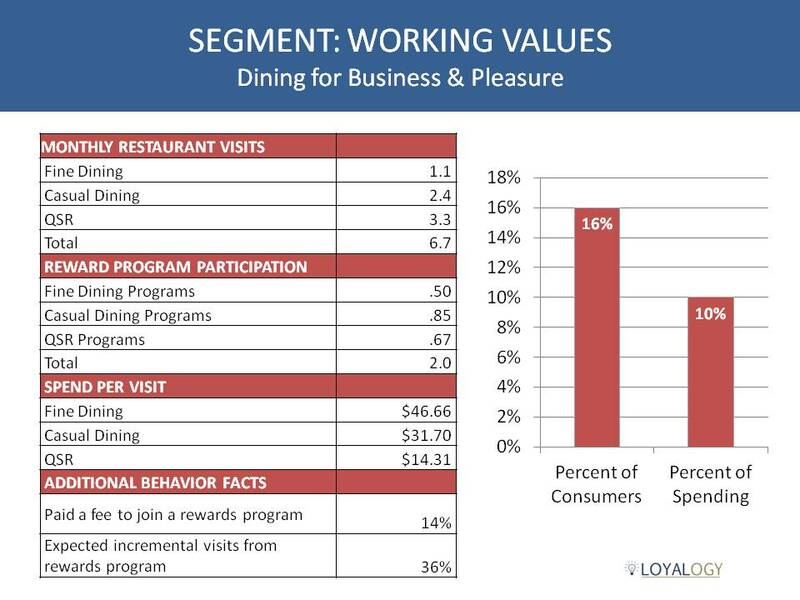 Loyalogy, leading provider of loyalty program analysis, data mining, reporting and consulting services to the restaurant industry, announced the results of its latesy U.S. study tracking consumer attitudes and behavior regarding restaurant rewards programs. 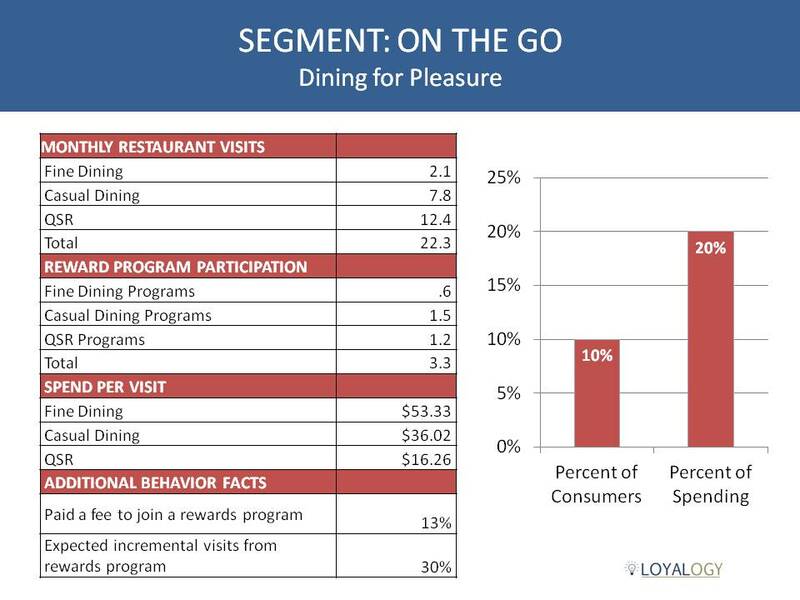 “Our latest study provides consistently clear evidence directly from consumers regarding the effectiveness of restaurant rewards programs and the importance of such programs to restaurant guests,” said Dennis Duffy, President of Loyalogy. Consumers estimate an appealing restaurant rewards programs would increase their visit rate to a particular restaurant by an average of 35%. Nearly three-fourths of consumers (73%) report they would recommend a restaurant more to others if that restaurant offered an appealing rewards program. 86% of consumers prefer a rewards program with a clearly-defined proposition in which they earn rewards based on spending or visits rather than a program built solely on periodic, surprise free items. 43% prefer a program that offers points which convert to rewards which may be spent like cash at the restaurant. 43% prefer a program that is based upon visits, such as 8 visits spending a minimum amount each visit would generate a free meal. 14% prefer a program that offers surprise free menu items that may be used for a certain period of time with no pre-defined criteria for receiving that free item. Consumers desire a simple reward program enrollment process in the restaurant and would prefer to supply additional information online after they have left the restaurant. Although consumer wallets are bulging with plastic cards, 60% of respondents stated that they don’t mind carrying a membership card for a rewards program if it’s necessary. A single rewards program membership covering multiple restaurant brands has significant appeal to consumers. 75% of respondents agreed they would like to have one rewards program membership that was honored at multiple restaurant chains. Consumers participate in an average of 3 restaurant rewards programs. Consumers are visiting restaurants an average of 13 times per month. The 25 to 34 year-old age segment, which includes the oldest members of the Millennial Generation, demonstrates a more intense use of restaurants and rewards programs. In our study we refer to this group as Millennials with Means because they fall into the Millennial age range and have a household income of $75,000 or more. Millennials with Means visit restaurants 40% more (18.5 visits per month versus 13 visits per month for the overall population). Millennials with Means participate in more than twice as many restaurant rewards programs (6.5 restaurant rewards programs versus 3 restaurant rewards programs for the overall population). Millennials with Means are more responsive to rewards programs. They estimate that an appealing restaurant rewards program will yield a visit increase of 43% versus 35% for the overall population. Millennials with Means are much more interested in managing all aspects of their rewards program participation with a smart phone app. A total of 57% of this group expressed a desire to do everything using a smart phone app versus 35% for the overall population. Restaurant visit rate and spending, including breakdown of those who visit restaurants just for pleasure or both pleasure and business. Traditional delivery/carry out pizza restaurants. Take and bake pizza usage from specialty brands and gourmet grocers. Participation rate in restaurant rewards programs. Usage of online services (website or mobile app) such as Open Table, Yelp, Urban Spoon and Trip Advisor. Usage of online ordering (website or mobile app). Relative appeal of 14 different reward program benefits. Attitudes about 9 different statements regarding carrying membership cards, using a phone number as identifier and receiving promotional e-mail messages from rewards programs. Attitudinal statements regarding the impact of rewards programs on behavior. Loyalogy was founded by Dennis Duffy who has more than twenty years of experience developing, managing and analyzing customer loyalty programs. Loyalogy provides loyalty program data analysis and data mining services, online dashboard and reporting tools, loyalty program development and consulting services and workshops for companies contemplating a customer loyalty program. For more information, visit www.loyalogy.com. As a gift card, the Cow Card is fairly standard. Customers can prepay and reload their Cow Card with cash either in person or online. Where the Cow Card stands out is with the auto-reload feature, which will automatically put money on a card once available ice cream funds dip below a preset level (you know, just in case). When customers use their Cow Card (either as a gift card or as a loyalty card), they will earn one point for every dollar they spend. 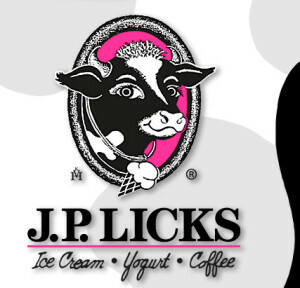 Customers who earn 50 points at any J.P. Licks location will earn a $5 gift card, which customers can use to buy “ice cream, home roasted coffee, espresso beverages, birthday cakes, anything J.P. Licks!” To sweeten the deal, J.P. Licks even offers a smartphone app for those who prefer to go cardless. For more information, visit the J.P. Licks website. Our mission is to be the leader in the Japanese restaurant industry. We are committed to satisfying our customers completely with the best quality food, excellent service and great value while providing the most pleasant, clean ambiance. Welcome to Kabuki Japanese Restaurant, the people behind sushi for all mankind. Never tried sushi or Japanese cuisine? Try us and we guarantee you will walk out hooked on our food. That’s what we do best; making non-believers into believers that Japanese cuisine is the new comfort food. When you walk into a Kabuki you won’t be overwhelmed with Asian decor and music. What you will encounter is a casual atmosphere with today’s hottest music playing, people smiling and our friendly staff welcoming you through the doors. Look for the Red Mask. Come Eat & Drink. Have Fun. 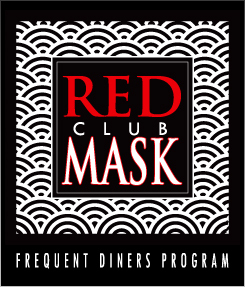 With the Red Mask Club, customers will receive a point for every dollar they spend at Kabuki. Once customers save 500 points, they will receive a $25 “thank you reward.” Customers will also receive periodic emails about promotions, events, and new menu items. For more information, visit the Kabuki website. Teppanyaki restaurants deserve great applause for their approach to dinner entertainment. Teppanyaki restaurants–more commonly known as Japanese steakhouses in the U.S.– are one of the few places where the entertainment is your dinner. Diners may never have another chance to see a volcano built from fried onions; flipping knives in any other setting is usually condoned, yet here it is celebrated. 10 Rewards Points just for signing up! 1 Reward Point for every $1 spent. Maximum of 200 points redeemable per check. your next visit. Reward dollars expire after 1 Year. Rewards members will also receive a $30 birthday reward, which makes the Kobe Rewards program an even better deal for customers. For more information, go to the Kobe Rewards website. For more information about Landry’s Select Club, visit the Landry’s website.